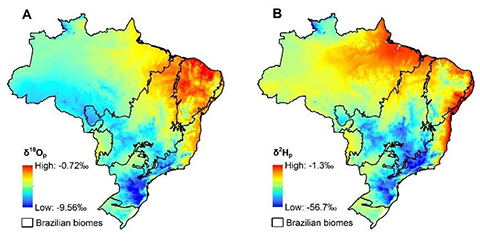 In a review about the use of isoscapes for natural resource management in the Brazilian context, which has high biological diversity and landscape heterogeneity, the authors present this figure that shows mean annual precipitation δ18O (A) and δ2H (B) isoscapes. As this figure presents, the average rates show a significantly lower spatial variation in comparison to temporal and spatial fluctuation found by other studies at a state level. 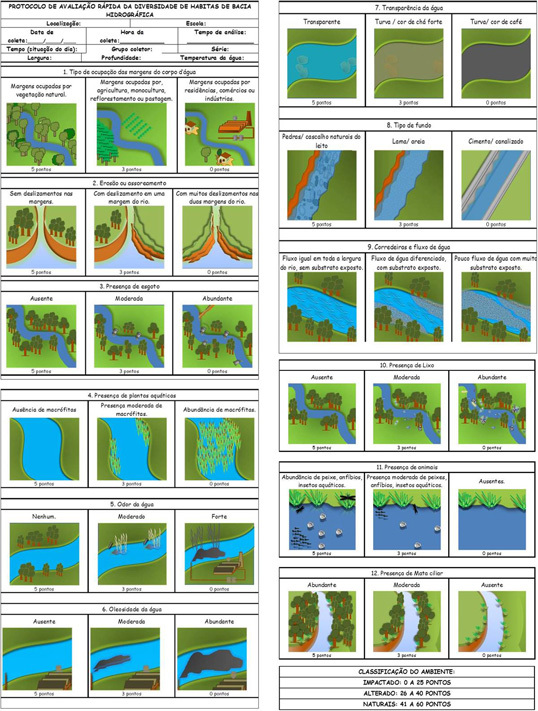 Therefore, developing precipitation isoscape models specific for Brazil is imperative, since current global models mask part of the natural variations of isotopic ratios. 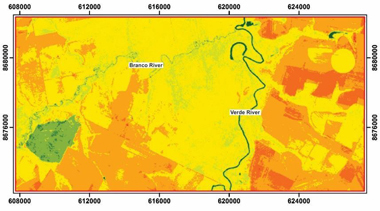 The figure shows the resulting morphometric characterization of Peixe river watershed derived from different digital elevation models generated from five elevation data sources (three from SRTM 90-meter resolution data and two from 1:100.000 scale topographic maps). 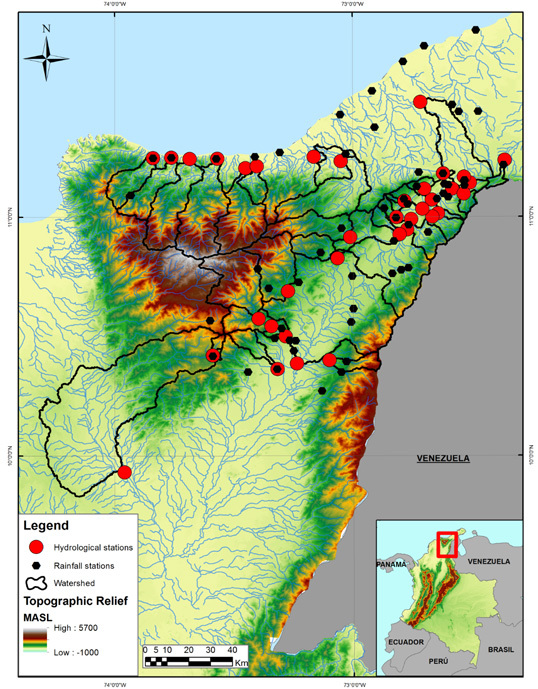 Results indicated that SRTM-O, SRTM-TR, and CT-TR provided the incorrect generation of hydrography in the region of the São Franciscana Depression (flat region), observed by the diversion of main river and generation of the mouth in another basin, causing significant errors in the determination of the morphometric characteristics of the basin, mainly in the drainage area and length of the main river. On the other hand, SRTM-TRH and CT-TRH presented excellent performance and are indicated for on-site study. 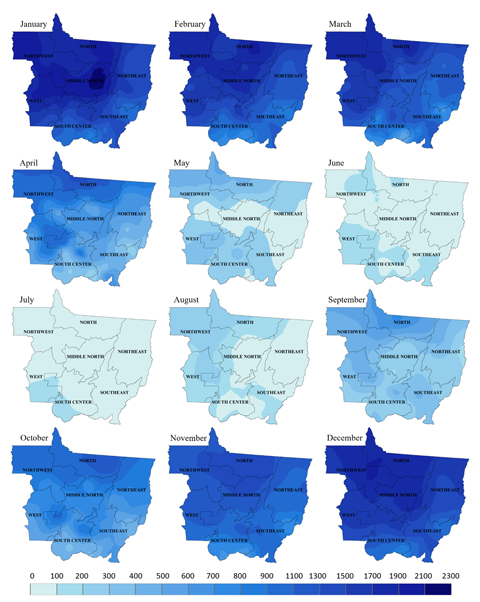 These maps show the variation of EI30 index that was computed as the product of total kinetic rainfall energy (EC) and maximum 30-min precipitation intensity (I30) in Mato Grosso State, Brazil. During the first and second EI30 periods (October-November and December-March, respectively) many agricultural activities occur in the State. The most critical period is October to February when activities such as tilling, sowing, and harvesting are concentrated. The third period (April-September) is the least critical because the majority of the soils are covered by the crop canopy. 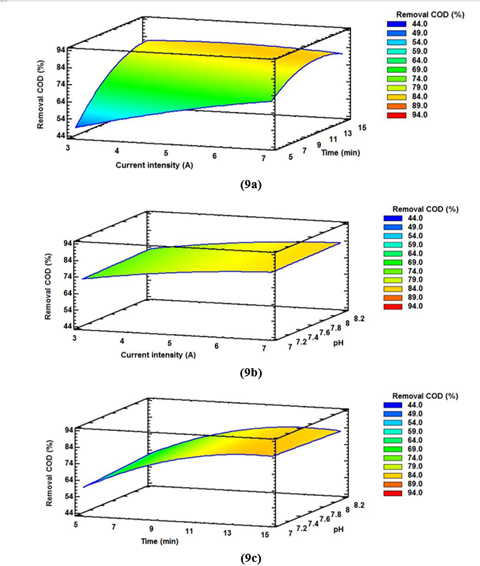 Domestic wastewater COD (Chemical Oxygen Demand) elimination using electrocoagulation is influenced by changes in current intensity, pH conditions and time. A three-dimension graphic visualization of the combination of two of these factors at a time is presented in this figure. Authors claim that this technique is more effective than biological processes for the removal of COD from domestic wastewater. 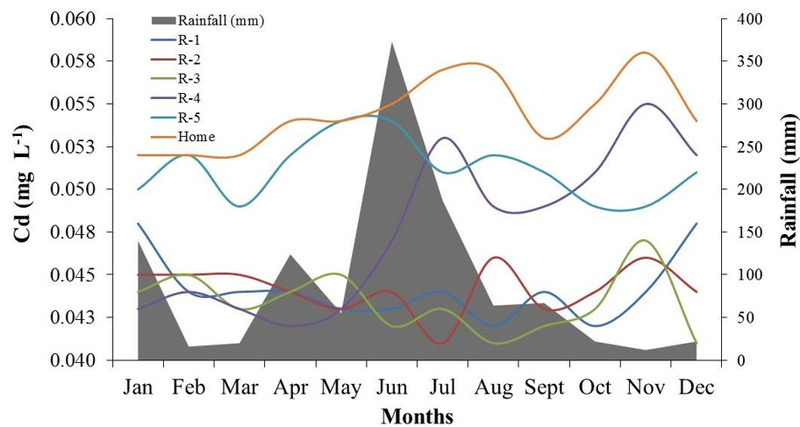 This graph shows the influence of rainfall on the seasonal variation in cadmium (Cd) concentration in water samples from five reservoirs (R) and an artesian well (home). Intensive farming using agrochemicals (fertilizers and pesticides) can increase heavy metal concentrations in the soil-water-plant system, especially in the case of elements poorly retained by the soil and easily lost to leaching. 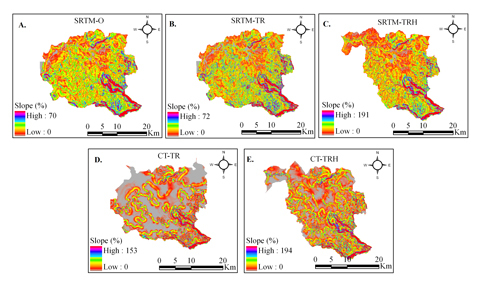 These maps show the results of applying inverse distance weighting (IDW) interpolation technique of temperature (A), pH (B) and total dissolved solids -TDS (C) against the distribution of breeding sites and water reservoirs to determine how susceptible these areas were for schistosomiasis intermediate hosts colonization. 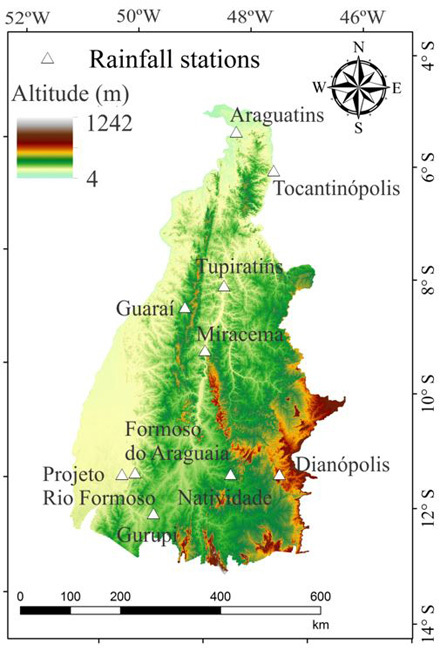 Map showing an area in central Mato Grosso State, Brazil, where albedo variation values of forest, burned vegetation, water, and crop areas were analyzed in this Amazon-Cerrado transition zone. 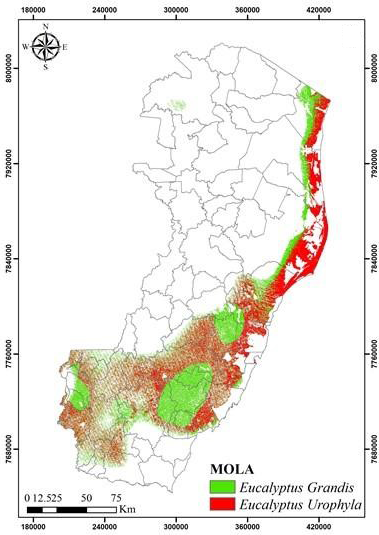 Maps showing adequate areas for the cultivation of two varieties of eucalyptus obtained by the application of the Multi-Objective Land Allocation (MOLA) tool. 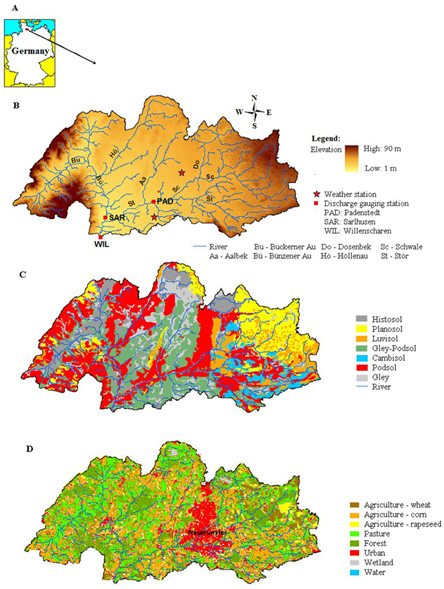 Maps of the upper Stör catchment including general location (A), elevation with gauging stations (B); soil (C); and land use (D). 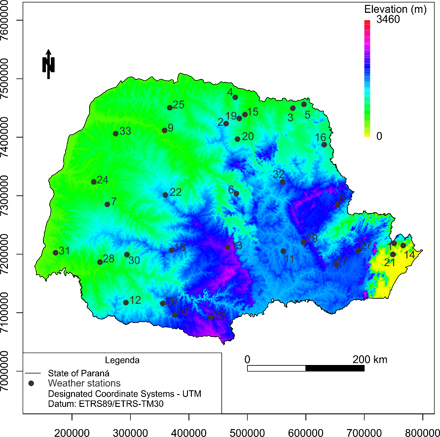 Influence of relief on H2S dispersion. 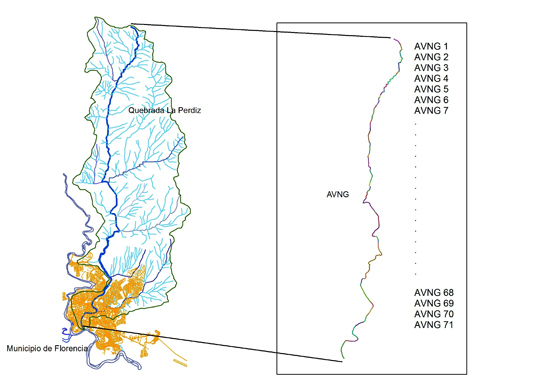 Test site to for the geo-inspired model of natural vector multi-agents corresponding to La Perdiz River Basin, Florencia city, Colombia. Protocolo de avaliação rápida de pontos da bacia hidrográfica. Trechos impactados: 0 a 25 pontos; trechos alterados: 26 a 40 pontos e trechos naturais: 41 a 60 pontos. 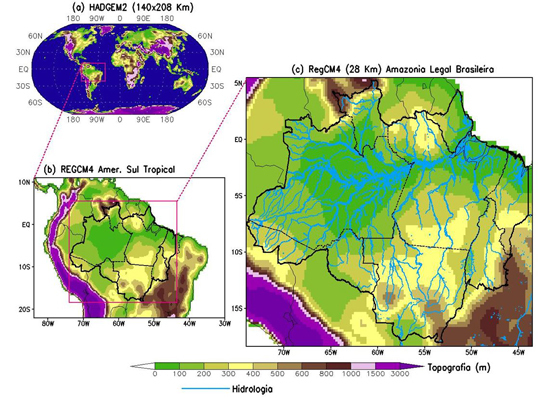 Domain of models: (a) global HadGEM2 (resolution 140 x 208 km) and (b) regional RegCM4 (resolution 28 x 28 km) of tropical South America with emphasis on (c) the Brazilian Amazon region. 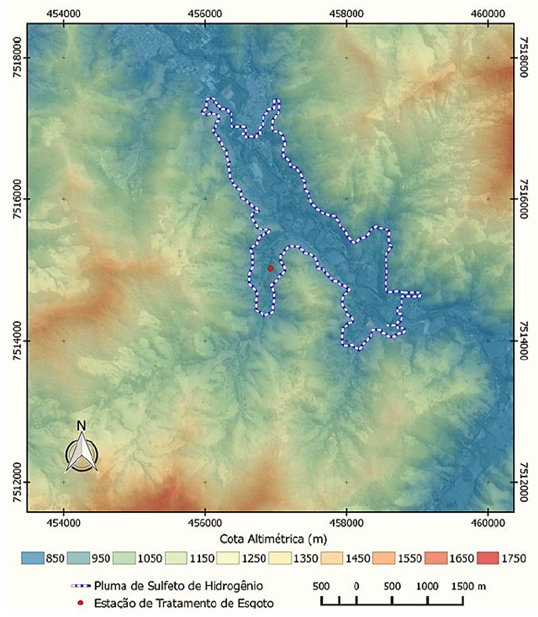 Colors represent the topography (m) and blue contours show the hydrology (main rivers). 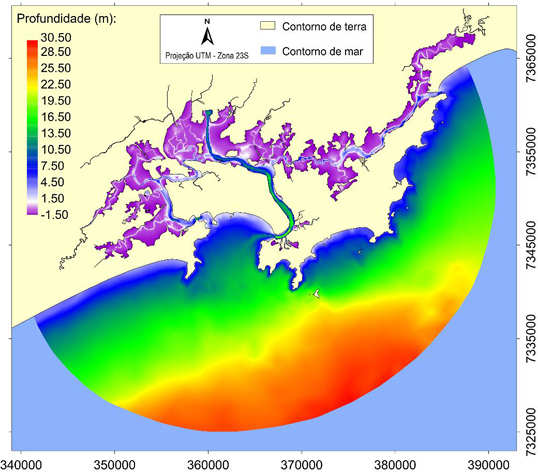 Bathymetry used in computational modeling of the Santos Estuarine System water renewal. Para celebrar 15 anos do Curso de Pós-Graduação em Ciências Ambientais da Universidade de Taubaté (UNITAU), o Conselho Editorial da Revista Ambiente & Água convidou o Coordenador e Vice-Coordenadora do Curso para editarem um número suplementar do volume 8, 2013 com os artigos mais significativos resultantes de dissertações dos últimos anos do curso.